If you’re looking for a cool sleeping memory foam mattress that will provide enough support for sleepers of every type, the Muse Sleep mattress might be right for you. The Muse Sleep bed incorporates the biggest advantages of memory foam mattresses into a patented formula which combines a gel swirl memory foam that makes for a cool and breathable sleeping experience. With the Muse Sleep mattress, heat won’t get in the way of snoozing. 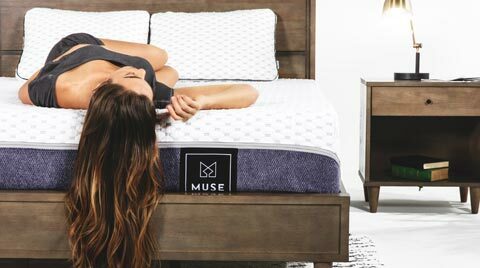 In this Muse Sleep bed review, we’ll walk you through all of the features of the Muse Sleep mattress and compare each of them to the competitors that the bed has in the rest of the market. Whether or not you’re familiar with the importance of sleeping cool, you’ll find that the Muse Sleep bed measures up favorably to some of the offerings by the biggest players’ most expensive offerings. Part of the reason for this is the attention to detail and technological approach that Muse Sleep brings to its mattress design philosophy. Muse is an American company with offices in the US, China, and France. With an abundance of high tech sleep science know-how, the leadership of Muse seeks to offer a customized sleeping experience at an affordable price. How long has Muse been in business? Operating since December 2016, Muse Sleep has made a splash in the mattress business by combining multiple engineering breakthroughs in mattress technology into one package to offer a powerful and subtle bed that defies expectations. What type of mattress does Muse Make? Muse Sleep makes a memory foam mattress that’s optimized for superior cool sleeping properties. If you’re a hot sleeper, the Muse Mattress may be the answer to your insomnia. Where are Muse mattresses made? Muse Sleep mattresses are designed and made domestically in the USA. Some elements of the outer cover are made from imported materials because they can’t be found here at home. Muse Sleep promises to make your sleep comfortable, cool and affordable. The Muse Sleep mattress is a stack of several different materials that are combined into the same package for superior sleeping characteristics. In the Muse mattress, you’ll find a cooling cover, gel infused foam, the responsive comfort foam of your choice, and a supportive foundation foam. The magic of the Muse Sleep mattress begins with the cooling cover, which uses the Cold Wire Plus phase-changing cooling fabric. The Cold Wire Plus absorbs heat that’s generated as you sleep and prevents that heat from bothering you while you sleep. Its comfort and support foams ensure that the bed transfers very little motion and relieves pressure with ease. For the comfort foam, you can pick between soft, medium, or firm insets. Each comfort foam is a different density which creates a different sleeping feeling so that you’ll get exactly the kind of bed that you want. Muse Sleep is exceedingly transparent regarding the construction and components which go into their mattress. Because of their openness, consumers who buy from Muse Sleep can rest assured that they won’t get any surprises regarding the components of their bed. Ultra-Cool Washable Cover: Premium 480 GSM (grams per square meter) Proprietary Cold Wire Fabric made of Polyethylene and Polyester knitted yarns. Temperature Regulating Gel Foam: 2″ of 4 lbs. density wave gel swirl memory foam. The Soft Mattress – 2″ of 3 lbs density memory foam with lower deflection value for a softer feel. The Medium Mattress – 2″ of 3 lbs density memory foam with a slightly higher deflection value. This creates a well balanced feel. The Firm Mattress – 2″ of 2.3 lbs density High Grade Flex Foam with an even higher deflection value. This creates Muse’s most supportive feel. Supportive Foundation: The Muse Sleep mattress is constructed with an excellent foundation made from 8 inches of 2 lb. density core support flex foam. It’s then covered in high quality fabric. This foundation will last many years because of its quality materials. It’s important to note that even far more expensive memory foam mattresses seldom use over 1.5 lb density cores. Dense foam layers create solid support and alignment. The Muse mattress offers exceptional contouring and pressure relief. Muse’s quality memory foam layers limit motion detection. Expect little to no sleep partner disturbance. The Muse mattress has great contouring qualities. However, these same pressure relieving features make movement more difficult than traditional coil spring beds. It’s a bit of a trade off, but we feel Muse’s positives outweigh this minor downside. Advanced temperature regulating technology make Muse Sleep far cooler than memory foams of the past. Because of the deeper body hug you get with the soft, this mattress may feel a bit warmer than the medium or firm models. As with most memory foam mattresses, there may be a slight scent that dissipates quickly once package is opened. However, Muse Sleep is CertiPUR certified to not emit any dangerous chemicals. Dense quality foams make Muse as durable as any high priced memory foam mattress on the market. Like most memory foam mattresses, this is not a particularly strong suit for the Muse mattress. Although longer periods exist, 120 days is more than enough time for most people to confirm their decision. The Muse Sleep mattress has an industry standard 10-year warranty. Shipping is free in the continental US and arrives within 5 - 7 days. Although in home delivery and set up is not available, this is still an advantageous feature. Actual shipping may vary depending on your location. Reduced mobility, particularly on the soft version, result in a lower score here. Muse delivers exceptional quality for reasonable price. We consider this mattress a great value. In contrast to most bed in the box mattresses, Muse Sleep offers 3 distinct firmness options. No one mattress is right for everyone. With Muse Sleep, you have the ability to choose the comfort option best for you! If you’re not sure what firmness is right for you, take the Sleep Personality Quiz on Muse Sleep’s website. Taking the Sleep Personality Quiz will explain which firmness is the best one for your body and why. By having a few options to pick from and getting the expert’s opinion via the quiz, you’ll be a more informed consumer and also sleep better as a result. There are three options which the Sleep Personality Quiz will suggest: firm, medium, and soft. The firm is designed to have the least amount of body hug and give. It’s feel is far less conforming than the medium or soft. How comfortable you sleep on this bed will depend on your prefered sleep position, body type and personal preference. The Muse firm is typically best for back and stomach sleepers but may be a bit too hard for side sleepers because of the force the bed pushes back with at concentrated points like the shoulders, hips and elbows. The Muse Sleep medium is a great alternative because it’s unlikely to clash with anyone’s sleeping style. The medium bed is perfect for couples who have contrasting sleeping styles, and many people will find it to be very comfortable. The soft is ideal for those seeking maximum hug and pressure relief. Here you’ll find a cloud like feel that cradles your body. This Muse mattress will easily conform to the curves of your spine while still offering substantial support. Back sleepers will gravitate towards the firm or medium. A mattress that is too soft can cause your lower back to dip too deep causing lumbar pain. How deep you sink and which bed is right for you often depends on your body type. A larger individual will be absorbed deeper into the mattress and may lean towards the firm. A person with less body mass will lay more on top of the surface and require the extra softness of the medium. Side sleepers will most likely choose the medium or soft. Both of these options provide greater body hug and conformity for the shoulders and hips. Better contouring reduces pressure points. Given that almost 70% of the population sleep this way, It’s an important consideration. A medium is where most sleepers of every position find their sweet spot. But, if you have a smaller body type, or extreme pressure sensitivities, the soft may be for you. Stomach sleeping puts extra stress on your back and neck.This can result in stiff, painful mornings regardless of the mattress you choose. However, many people still find this their position of choice. For those who do sleep on their stomach, the firm might be for you. It will keep your lower back from dipping and causing lumbar pain. However, a more petite person will not sink as far and may fare better with the medium. It’s also a matter of personal preference. Superior pressure relief: Dense layers of contouring memory foam create ideal sleep environment. Limited motion detection: Sleep partner disturbance is kept to a minimum. Available in 3 firmness options: Muse Sleep covers a full range of comfort preferences. Great dollar value: The muse mattress has similar specifications to mattresses costing twice as much. Edge support: Like most memory foam options, the Muse Sleep mattress does not provide the same degree off edge support as a coil can. If you like the pressure relieving feel of foam but want a more substantial edge to edge support, consider a hybrid. IDLE Sleep or KAYA Sleep offer quality alternatives at reasonable price points. Both utilize full edge to edge coil support. Those wanting to sleep cool will appreciate the Muse Sleep’s technology based cooling methods. If you like the feel of memory but are concerned about heat retention, Muse Sleep might be for you. Couples seeking less partner sleep disturbance will enjoy Muse Sleep’s low motion transfer. If you are searching for maximum pressure relief, the Muse Sleep mattress might be for you. Dense layers of quality foam gently contour and conform to the curves of your spine. Bargain shoppers will like what the Muse mattress has to offer. Compare specifications with well known more expensive brands and you’ll see what a great value this mattress is. Those in search of multiple firmness options to choose from will appreciate 3 different comfort levels to choose from. Sleepers who prefer a mattress with a buoyant bouncy feel will not like Muse. Quality memory foam is all about conforming pressure relief. That said, you tend to sleep in memory foam, not on it. It’s not a question of right or wrong. It’s simply a personal preference. If you prefer the feel of coil springs over all foam, Muse will not be for you. They are distinctively different feels and neither is right for everyone. However, if you like the comfort of memory foam but prefer the more structured support of an innerspring, a hybrid might be worth considering. Take a look into Tomorrow Sleep by Serta Simmons. It’s made with quality memory foam and individually pocketed coils. The mattress weighs about 75 pounds, which means that you may need a hand getting it out of the box and into its resting place. Once you maneuver the mattress into the bedroom, it needs to be unpacked from the plastic seal. A special cutting tool is included for this purpose. We recommend placing your mattress on the the bed prior to unwrapping. Being careful not to damage the fabric, carefully cut through the protective plastic. Once the vacuum seal is broken, you will hear the sound of air passing quickly into your mattress. It will expand quickly but still need time to decompress and aerate. Although you can lay down on your bed right away, the Muse will fully expand in a few hours. Colder outside temperatures can affect this duration. Memory foam is heat sensitive. Your mattress may require a bit longer to soften an take shape when delivered during winter months. Note: As with any quality mattress, It’s essential a Queen or King have a frame with a sturdy center support and additional legs on the ground. Over time, Inferior frames can affect the support and longevity of your mattress. How Does the Muse Sleep Mattress Measure Up to the Competition? The Muse Sleep mattress has a lot of competitors who also claim to provide a superior cooling and comfortable memory foam combination but, are they as good as the Muse Sleep mattress? In this section, we’ll take a quick look at some of the Muse Sleep mattress’ competitors and offer a quick comparison so that you’ll know what the rest of the market looks like for similar beds. Not customizable – Only one firmness level available. Casper will not disclose foam densities; can’t compare specs. When you purchase the Muse Sleep mattress, you’ll get a bed that works with your body to keep you cool during the night no matter what your preference for firmness is, unlike many other memory foam mattresses. You can pick the perfect firmness for your sleeping style. Whether or not your partner has the same sleeping style as you, the Muse Sleep bed will prevent you from being awoken by their tossing and turning, which is a huge benefit. The market is filled with mattresses that are both more and less expensive than the Muse Sleep. That said, few can boast as much value. Muse Sleep is durable, comes with a stellar warranty, and has an extensive trial period. If you are a fan of memory foam and you are looking for a great value, Muse Sleep is worth your consideration.